Dark, mysterious, and majestic, this skin may be a little spooky, but definitely makes an impression. Any hunter displaying this skin can do so proudly, knowing it informs all who see it of their dedication to the hunt, and their incredible tournament accomplishments. The Sphynx Wrath Black Cat Skin can be used on the Sphynx Wrath. The trap's stats (power, power bonus, attraction bonus, etc.) are not changed. The Sphynx Wrath Black Cat Skin can be purchased in the Tournament Hall Trapsmith in exchange for 50 Tournament Tokens. Hunters must have a Sphynx Wrath Champion Skin in their inventory to purchase this skin. The Sphynx Wrath Black Cat Skin cannot be traded on the Marketplace or through Give To Friends. 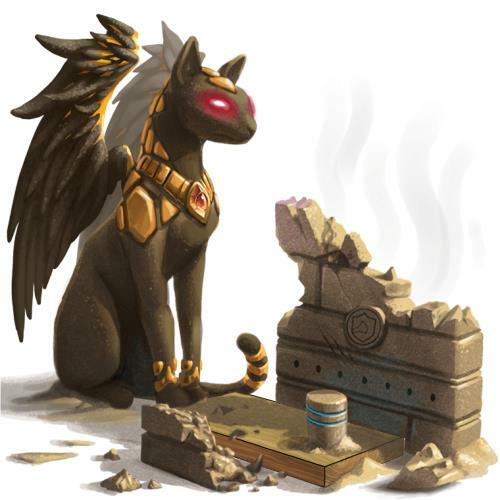 17 October 2012: The Sphynx Wrath Black Cat Skin was introduced. This page was last edited on 9 December 2017, at 15:03.